Do you know the saying: You can’t outrun a bad diet? Well, it’s absolutely true! No matter what your health and diabetes goals are, your nutrition is one of the most important factors that will impact whether you reach your goals or not. That’s why I’m sharing this Fit With Diabetes Meal Plan with you today. We all have different calorie needs. Your daily calorie need depends on your size, fitness level, daily activity, gender, etc. 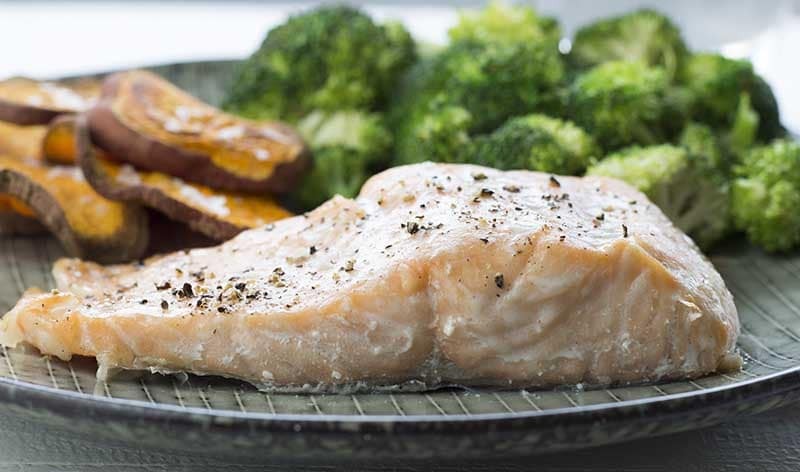 When you are creating a healthy diabetes meal plan, your first step should therefore always be to calculate your “calorie equilibrium”, or how many calories you need each day to maintain your current weight. You can learn exactly how to find your calorie equilibrium with 5 easy steps in this post: “How to Find Your Daily Calorie Need“. The example below is a 1,600 calorie/day plan, but you can download the meal plan as a PDF with many different calorie levels (and a handy shopping list). The download also includes a version with grams instead of ounces for my international friends. Instructions: Blend oats, egg whites, and stevia and bake as pancakes. 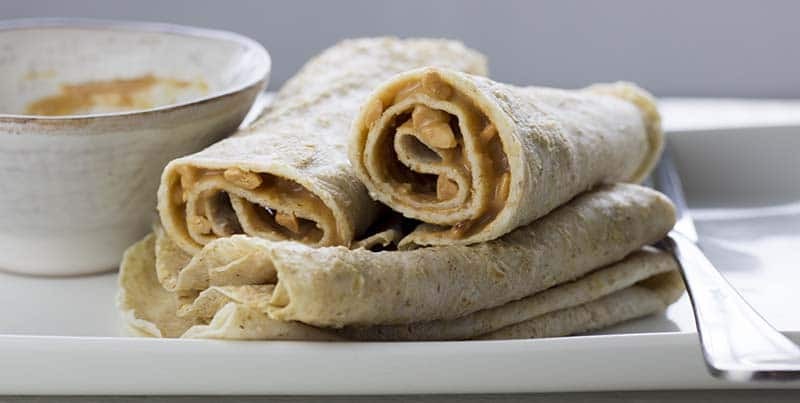 Spread the nut butter on the pancakes, roll them up, and enjoy. Pro tip: Make enough pancakes for 3-4 days and store them in the fridge. 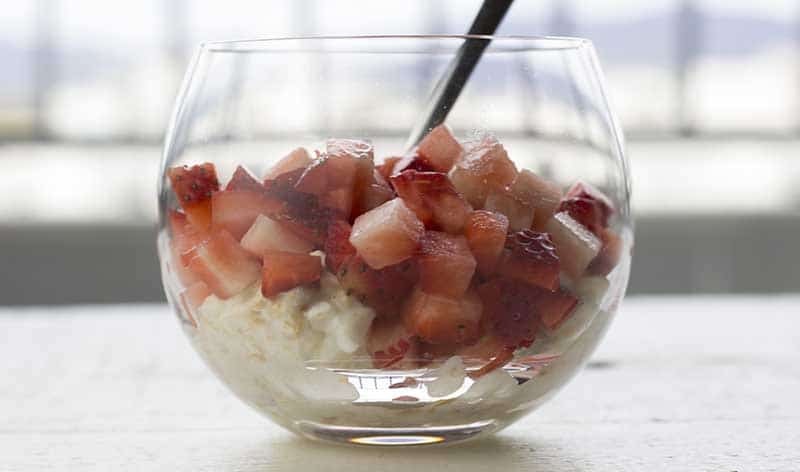 Instructions: Mix a little Stevia into the yogurt and sprinkle chopped almonds and strawberry slices on top. Instructions: Fry the ground turkey in a pan with a little cooking spray and salt & pepper until cooked through. Set aside. 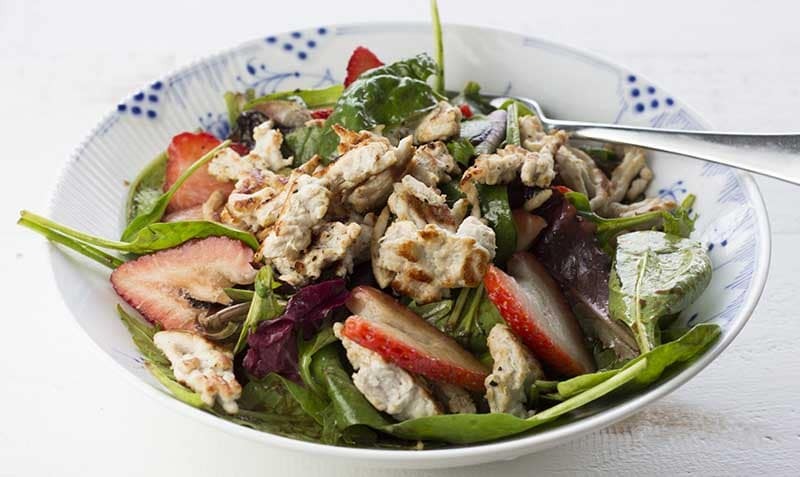 Mix the olive oil, mustard, and balsamic vinegar and toss the mixed greens and strawberries in this vinaigrette. Serve the salad with the turkey on top. Instructions: Cut the chicken into thin slices and season with pepper. Cut veggies into sticks. 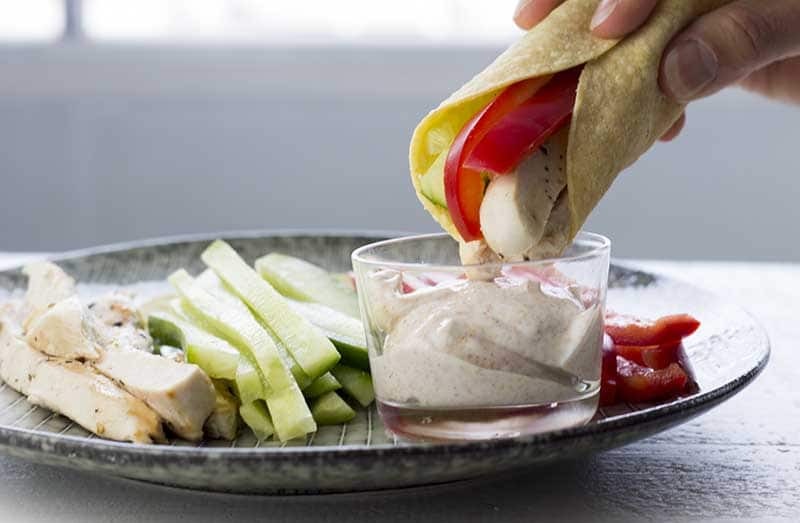 Roll chicken and veggie sticks in a tortilla. Mix yogurt, curry, and paprika into a quick and delicious dip, and dip away. Pro tip: Follow my “How to Cook the Perfect Chicken Breast” guide to cook a delicious, juicy chicken breast. Instructions: Cut the sweet potatoes into fries and coat them lightly with cooking spray. Bake in the oven for 45-60 min at 400 F (200 C). Season salmon with salt and pepper and bake in the oven for 15 min at 400 F (200 C). Steam, boil or bake the veggies and serve on the side. Instructions: Mix cottage cheese with peanut butter and Stevia. Serve with sliced strawberries on top. Daily totals: 1,625 calories, 161 g protein, 119 g carbs, and 56 g fat. I like to eat the same foods for several days in a row with only minor changes and then change the plan every week or so. 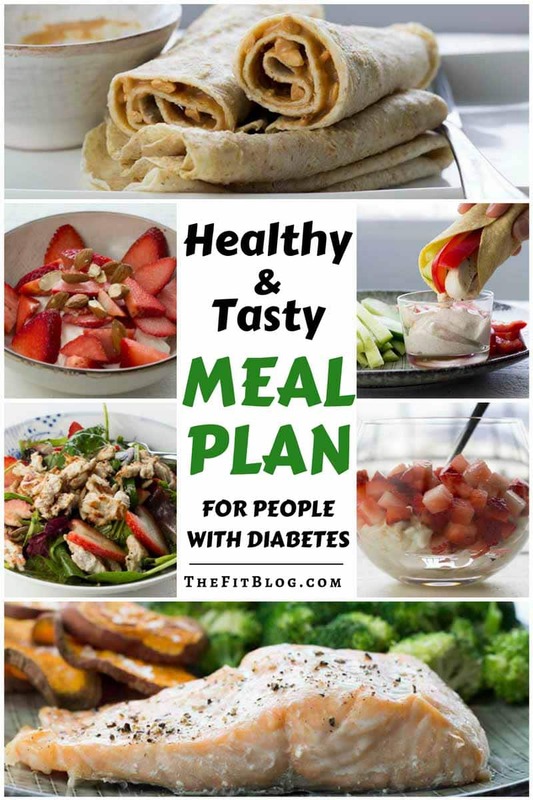 I would suggest that you follow this plan for a week and then start on the Fit with Diabetes Meal Plan #2. You can also go back and read my first meal plan example. Your site is a pray’s answer. I was diagnosed with Dt2 in 2009. With really no guidance, other than what I found on the Internet I didn’t know much. I cut carbs and sugar from diet and exercised for two hours a day. Everything dropped – all was good. Then out of nowhere, I’m back with high glucose levels and feeling like crap. No one really tells you you are a diabetic for life. It has been a long struggle, reading books, websites, and learning from others. *tears in my eyes* I have poured myself over your website past couple hours. Thank you from the bottom of my heart. It feels like a load is lifted off my shoulders. I don’t feel hopeless. I feel that I can do this. Love the info and will probably start using it! I am a college athlete with type one diabetes and would like to gain weight and muscle. I am 5’5” and 115 pounds. Would love to weigh around 130. Can you maybe post some meals with the daily caloric intake at around 3000? It would be very helpful 🙂 thanks! This might be a dumb question but Does serving size mean that’s how many oz it’s going to be? Yes, the serving size is the amount, being oz., tbsp. etc. So if the measure is oz. and serving size is 0.9 that means 0.9 oz. Hi, I’ve started the meal plan today – and I think sticking to the same meals for a week makes sense (less calculating carbs for every meal, every day – just repeat/ refer to yesterday which makes less brain work every day!). I just made the pancakes and I’ve got to say it was a bit of a fail – I quadrupled the amounts but think it would be easier to do as single serves as the egg whites and oats separated out as pouring into the pan. I also think they’d be better with normal oats instead of steel cut oats as I used. But live and learn- my attempt can only improve next go at making them. Yes, definitely use old fashioned oats and I recommend blending it all together before pouring it into the pan. I know a few have had luck with steel cut oats, but I think you have to soak them for a REALLY long time for it to work. Thank you for providing all of this awesome information & guidance! I was wondering if you could add the conversion to cups next to the ounces in the recipes? Thank you for all your hard work. I have figured out my calorie needs per day and read about meal planning. Now to put it into action. I kept my food,water,activity log today and my blood sugar has done really well. Look forward to continue to learn and stay healthy. Thank you again. I am 64 and recently diagnosed as T1. Learning to calculate carbs is challenging, but shouldn’t I also count the grams of sugar? Grams of sugar is a component of total carbs. So when you read nutrition labels you might see 20 g of carb, and then listed how much of that is sugar and how much is fibre. This meal plan is fabulous! All foods that I love and all recipes so easy and quick to prepare! Thank you, Cristel. I plan to prepare every single one of these meals. I’m excited to start trying these! Is there a print-friendly format that has the details listed above that I can print to work from in my kitchen? The PDF is great with the specific nutrition values and shopping list but I need the instructions for prep, too. When I try to just print the page the ads and social media icons cover up a lot of the instructions. Thanks! Any low/medium glycemic complex carb can pretty much be used in replacement of the tortilla. That could be a pita, rye, wholegrain bread, rice, potato, etc. You just have to watch and match the serving size. Same logic goes for the peanut butter, any (unsweetened) nut butter will do, alternatively almonds, avocado or oil are good straight up fat sources. Hi! Im so excited to start your meal plan. Are the protein pancakes supposed to be pretty runny or am i doing something wrong? Glad you’re excited about starting the plan. Yes, the pancake mix is very “watery”, but should firm up when it hits the pan. The trick is to blend the oats and the egg whites so that they get an even consistency. Is this meal plan intended to be six small meals per day or can you combine them to be closer to 3-4 meals? It’s intended as 6 small meals but you can easily combine them into 3-4 meals instead if that works better for you. I find it easier to keep my blood sugar steady and avoid hunger with 6 meals, but it’s really personal preference how often you eat. I wish that there were plans to fit a vegan or even vegetarian observer. The whole world does not eat meat. If a person with this lifestyle would like to find a meal plan to observe for your challenge where would one look? We may be different but we want to be fit in our lives as well. I fully agree. The reason why I don’t have any vegan meal plans on Diabetes Strong is simply that I am not a vegan and I don’t know enough about it to create a healthy meal plan. I don’t want to post anything that I haven’t tried myself and know works. I don’t know where you would find vegan meal plans, but I am sure there are a lot of vegan blogs you could try.